Steinway Piano Covers is rated 4.89 out of 5 based on 200 ratings. Please choose piano type and cover material. Vinyl: Our vinyl non-padded piano covers are practically impervious to liquids and excellent against dust, dirt, pet hair and minor trauma. Breathable at each seam, vinyl is hands down the easist material to clean - just a quick wipe and your done. Construction is a vinyl topcoat which is melded to a super-soft backing. Available in black vinyl (our most popular color as most pianos are black), or brown, burgundy, tan or white vinyl. Remember, vinyls are NOT designed for more than 2hrs/day of DIRECT sunlight - in this case, please see our MacIntosh, Quilted or Premium Covers below. Our Standard Quilt is designed to withstand light-medium blunt trauma. It is constructed of a lightweight nylon top, 3/8” thick cotton flannel batting and a soft white cotton backing. Available in black. Our Premium Quilt is designed to withstand light-medium blunt and pulling trauma and is water/liquid resistant. It is constructed of a medium weight nylon top, a dense 3/8” poly-cotton batting thick and a soft cotton backing. Available in black and brown. Our Macintosh Quilt is designed to withstand medium blunt and major pulling trauma. It is constructed of a heavyweight cotton drill cloth, a dense ½” thick cotton flannel batting and a soft cotton backing. Available in black. Our Double Black Padding Quilt is an Extra Heavy Black Premium Quilt, basically the Black Premium with about twice the padding. 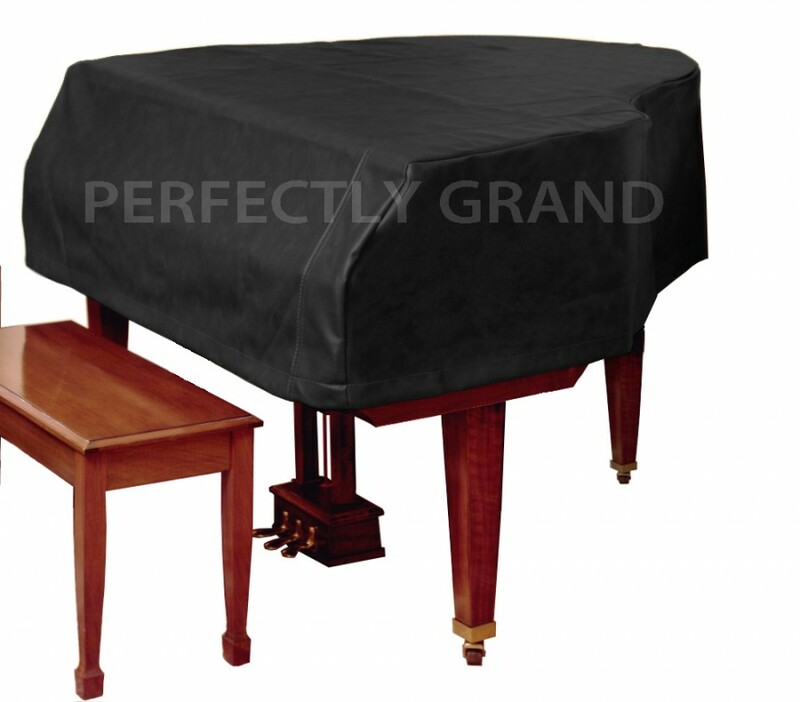 Optional Split Sides (Add $50.00): Our standard covers come without split sides, but you can add the special option of SPLIT SIDES: Please note, if you intend on playing the piano with the cover on it is highly recommended that you get the split sides. Optional Full-Length Skirt (Add $90.00): Our covers normally stop 1" below the bottom rim, a Full-Length Skirt extends the cover the rest of the way to the floor. This is option is perfect when you want to protect the legs and lyre as well as the body and lid of the piano. Optional Embroidery (Add $85.00): Piano names (Yamaha, Steinway, etc.) can be embroidered on either the right front side or above the keys. Lettering is 2" high with your choice of thread colors: gold, silver, white, pink, yellow or blue. For custom embroidery (anything other than piano brand names) call 800-792-4457. Optional Locking Straps (Add $12.50 per strap): Locking straps are attached to the bottom hem of the cover - you may choose either 3 straps (for small grands) or 4 straps (for large grands). Each strap has a metal "D" ring at the end where you hook a lock (not included). Cat Cover: (By Quote Only) Do you have CATS that LOVE your PIANO? Does Your Piano Need Protection from Cat Issues? This is very common, and we've developed a CAT COVER that offers great protection of your piano without pulling at your cat claws. Call customer service or email [email protected] for any questions you might have about a Cat Cover for your Piano. Timing: Because we make each piano cover one at time on order, it can take between 10 and 12 days to make your cover, plus shipping time. Embroidery adds up to 5 extra days to the turnaround time. If you pay for expedited shipping it will only save time on the shipping, it cannot speed up the time it takes to make the cover. Upright pianos can have very different measurements. To make sure your cover fits perfectly, print out the measurement chart and follow the directions. Remember to double check all your measurements*. After you fill out the chart, transfer to information to the fields above and place your order we'll get started on your cover right away.